Elsewhere, Manchester United and Tottenham are considering bids for Fulham’s teenage sensation Ryan Sessegnon. 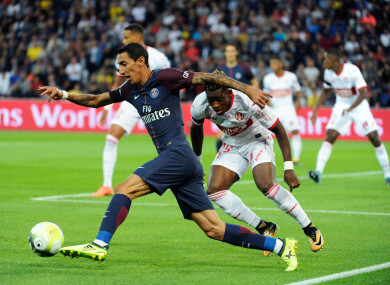 Di Maria in action for PSG. With the 31 August transfer deadline fast approaching, Phillippe Coutinho‘s future still remains up in the air. The Brazilian schemer has yet to line out for Liverpool this term, and the Reds have rejected three bids from Barcelona — the latest of which is reportedly worth €125 million. According to Mundo Deportivo in Spain, the Catalan giants could now turn their attention to bringing former Real Madrid winger Angel Di Maria — these days with Paris Saint-Germain — back to La Liga. 17-year-old Ryan Sessegnon is seen as one of the most promising young talents in English football right now. The left-sided Fulham teenager has represented England at U19 level and both Manchester United and Tottenham are believed to be interested in signing him. And Sky Sports reports that United would be willing to loan Sessegnon back to the Championship club if a deal was struck. In news just in, Burnley have finally confirmed that New Zealand striker Chris Wood is joining from Leeds United for a club-record £15m. SIGNING: Burnley Football Club is delighted to confirm the signing of Chris Wood from Leeds United for a club record fee. Premier League newcomers Brighton & Hove Albion have completed a £13.5m deal for Colombian winger Jose Izquierdo, who arrives from Club Brugge. Meanwhile, Crystal Palace are chasing RB Leipzig’s Oliver Burke, who was left out of their squad for the Bundesliga opener against Schalke. The 20-year-old Scot is valued at around £15m, but Palace may need to offload a couple of players first. Like so many players who find themselves out-of-favour, Samir Nasri has wound up in Turkey. The French international was told he had no future at Manchester City by manager Pep Guardiola and now is set to be announced as Antalyaspor’s latest recruit. Having won the Eredivisie title as well as four KNVB Cups over a seven-year period with Feyenoord, goalkeeper Ed de Goey joined Chelsea for £2.25m in the summer of 1997 — making him the most expensive goalkeeper in English football at the time. The Dutchman endured a difficult start to life in the Premier League but went on to lift the FA Cup, League Cup and Uefa Cup Winners’ Cup with the Londoners before seeing out his playing days at Stoke City. Capped 31 times for the Netherlands, De Goey also featured at the 1994 World Cup. Email “Barca turn to Di Maria as Coutinho alternative and today's transfer gossip ”. Feedback on “Barca turn to Di Maria as Coutinho alternative and today's transfer gossip ”.